Taking pills that just mask the pain, or sometimes doesn't even work isn't worth the hassle. It is better to use something that actually relieves the pain. When I first used Arnicare, I couldn't believe how fast it worked! This past week in yoga class, we have been practicing the more advanced poses since we are nearing the end of the term. With the more advanced yoga poses comes sore muscles. Arnicare has helped me through this weekend as I have advanced my yoga poses even more through my home practice. It has helped me ease my pain, and has kept me from suffering all weekend. Don't get me wrong, yoga does wonders for the body, but I am afraid that I over exert myself sometimes, and then comes the use of Arnicare. This week is the week of muscle spasms, muscle pains, and muscle strains for my family. I let them use Arnicare to help them relieve their pain faster. I started using Arnicare on Thursday when I came home with my back out of wack. During Thursday's yoga class, we practiced alignment, and twisting of the spine, which is actually very healthy for you. It seems as though an aligned spine feels unnatural compared to a non-aligned spine. Funny, I know. When I got home, I was very uncomfortable from the pain in my back, and up and down my spine. I figured it was the perfect time to try my Arnicare gel, so I squeezed some on my hands and I rubbed it on my lower back, and pulled the gel up my spine and along the sides. I kid you not, within seconds, my back pain was GONE! It was incredible. I have never felt pain relief work that fast. What I love most about this fast acting, magic in a tube is that it is all natural, and it works naturally with your body to relieve your pain fast. Not only does Arnicare help to relieve pain in your muscles, but it also keeps swelling down, works with bruising to bring skin and vessels back to normal. 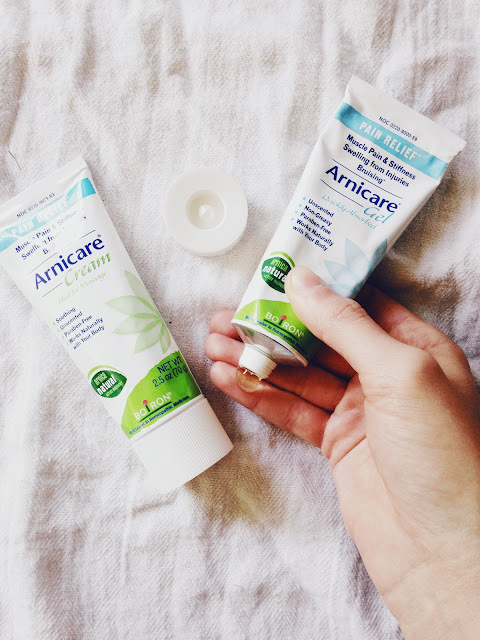 I haven't tried the Arnicare gel for bruising or swelling yet, but when I run into a table, or my skin starts to swell from an injury, Arnicare will be my go-to treatment. 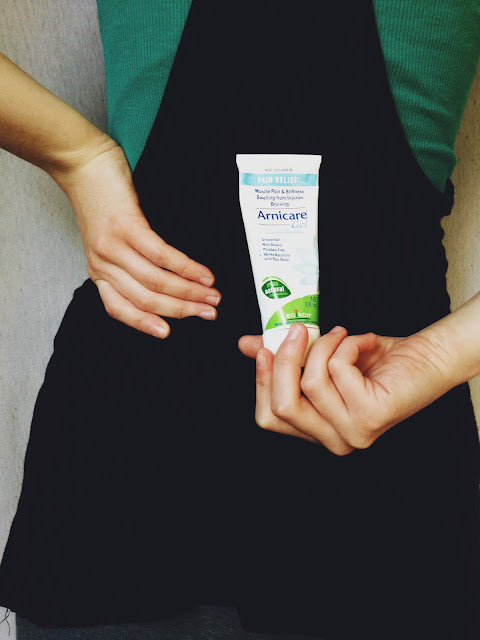 Arnicare Gel is perfect for on-the-go, fast pain relief. It is quickly absorbed into the skin, and it isn't a sticky formula! The gel doesn't make your fingers or hands sticky after application, which is a bonus for on-the-go pain relief. It is perfect for the sports bag, or gym locker for after a hard practice, or a long workout. 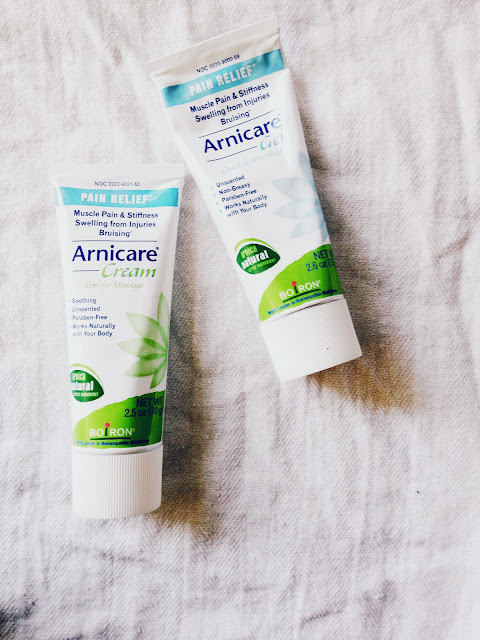 Arnicare Cream is ideal for massage. Pressing, touch, and massage is very nurturing for an injury, but when you massage your injury with Arnicare, you receive faster pain relief! Arnicare is a perfect addition to a first-aid kit, purse, or go-bag. You never know when you are going to be suffering from muscle pain, so you always want to be prepared. It is now in my first-aid kit, and I love knowing it is there for me incase I have muscle pain. With practicing yoga, and transitioning into more advanced poses, I am going to have to rely on my Arnicare gel and cream often for fast pain relief. It is nice to know that my local Walgreens and Target supply my favorite Boiron products! So, when I run out of My Arnicare, I can always get some more. If you have muscle pain, and need fast relief, give Arnicare a try. They are the number ONE, homeopathic pain reliever! Visit the Boiron website here to learn more about their homeopathic topicals, and to find a store that supplies it near you. This post was sponsored by Boiron USA. All pictures and opinions are my own.